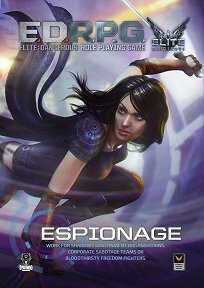 Publisher's blurb: "As a spy you will find yourself working for shadowy government organisations, corporate sabotage teams or bloodthirsty freedom fighters. Be prepared to engage in hacking, stealth, thievery, investigation, assassination, uncovering plots, preventing atrocities and spreading scandalous rumours. All for the public good, of course..."